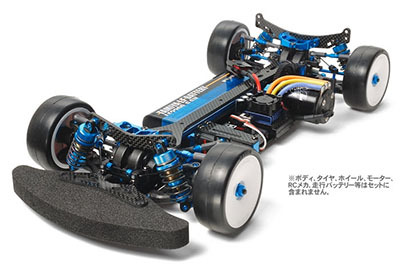 Tamiya is proud to introduce the TB EVO.6 chassis, the 6th generation model in the Tamiya's TB EVO premier shaft-driven chassis series. This high performance chassis utilizes a double deck layout with 2.0mm upper and 2.25mm lower carbon fiber decks for an alluring combination of excellent rigidity, and lateral flexibility during cornering. Both the mount for the horizontally positioned left-side motor and also the center bevel mount have been incorporated into an integrated aluminum piece, thus improving gear mesh and heightening drivetrain efficiency. The drivetrain utilizes front direct-drive and a rear gear differential setup. High-spec parts such as large capacity TRF short dampers, TRF418 suspension arms and aluminum suspension mounts come as standard.